For her second library pick Cat picked another Scooby Doo book and it was not as big of a hit as the first one. Scooby Doo! and the Opera Ogre has all the right things to be a great book. Cat and I both lost interest very quickly though because the story started to drag very fast. 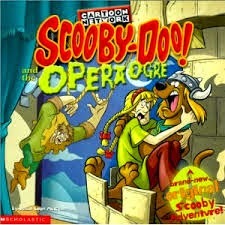 How may times can you have Shaggy and Scooby dress up in a costume and get chased exactly before it gets old hat? The concept was cute but we are hoping the next book she brings home holds her interest better. Last night, I was standing in front of Redbox, looking for a flick. A little boy, about 8, came up beside me. He nudged me, flashed a huge smile and in his thick Southern accent, he said, "I'm just lookin' fer a movie." Suddenly, he grabbed my arm and shouted, "Oh, look! It's Scooby Doo! I love Scooby Doo!" and you could just tell that he anticipated the same reaction from me. It was the cutest thing ever.